Maria Elvira Martinez, was my baptismal name. I was born in a small mountain village, in New Mexico, name Truchas. I was born into a loving family, and can now look back and see my vocation was born and nurtured from the beginning with this family. My parents and siblings never dreamt I would choose religious life, and were as surprised as I was of my calling. My parents, did, however, teach me how to pray and listen to God’s voice within. When I was 19, after a year of college, I felt the call. At first, I responded to an invitation to “Come and See.” This type of event is typically a day or weekend hosted by a Congregation for young women who want more information about vowed life. I wasn’t immediately sure that this was the vocation that God wanted for me or more honesty, that it was what I wanted. My discernment has been an ongoing journey of faith, I continue to seek, to discover and rediscover who Jesus is and who I am, so as to deepen our relationship. As I celebrate my 60th Jubilee as a vowed Religious (2016), I continue my journey of faith. I hope that through the years I have learned to live my life with greater love, simplicity, and integrity. As I reflect in gratitude on the many blessings in my life as a Sister, I have come to discover God’s loving mercy and an unfolding plan for my life. I am especially grateful for the many opportunities for ministry that have allowed me to share my personal gifts in many diverse communities and locations. I started first as a school teacher, but early on I was called into Hispanic ministry. I served on a parish and diocesan level as, Religious Education Director, Pastoral Life Coordinator, evangelizer, catechist, and spiritual director. I have served primarily in immigrant, marginalize Spanish speaking communities, and I have been greatly enriched by these experiences. I praise God for these blessings. Religious Education from Aquinas College. Doctorate of Ministry, Jesuit School of Theology Berkeley. Advanced Biblical Studies in Spain and Costa Rico. Among Sr. Dolorita’s ministries was Women of Grace | Mujer en Gracia. 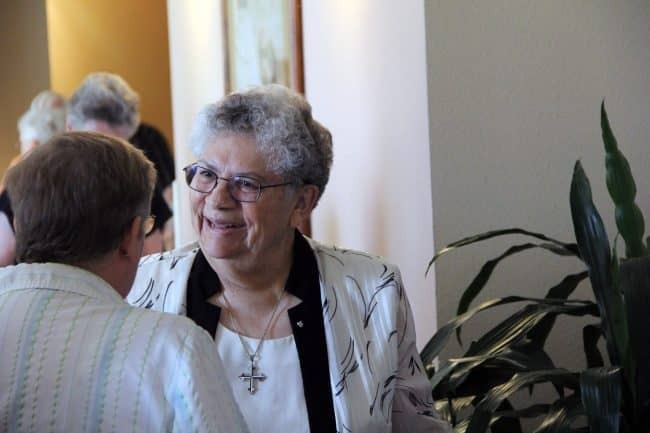 This program was led by Sister Dolorita, who is also a Spiritual Director, for women who wished to stand in solidarity with other women, recognizing holiness in one another, sharing Scripture and friendship.